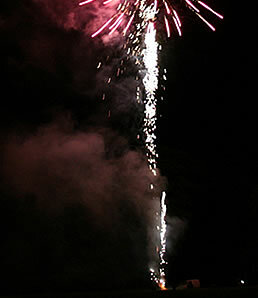 We are a family run company based near Harrogate in North Yorkshire and have been firework contractors for 30 years. We perform country wide and in our local area are recommended by Ripley Castle, Rudding House & Swinton Park We work closely with the local council and perform their large display in November as well as local villages, schools and hotels. Our reputation is the highest in the area and we have gained trust and respect from all the Stately Homes and Castles because of our spectacular and safe displays. All our displays are individually designed and, in the case of weddings, we try to incorporate the main colour theme of the wedding into the display to make the show extra special for our clients. Our teams perform all year round, for weddings, corporate evenings, 4th July, bonfire night and New Years Eve. In all our shows we use professional fireworks including giant candles, large cake barrages (which give lots of different effects and noises) and mortar shells of various sizes which explode high in the air filling the sky with colours. Please do not hesitate to contact us if you require further information. We will be only too pleased to help.